Logo imprinted promotional outdoor safe 2 x 3.5 square corner business card magnets creates impact on the crowd, when properly placed on car doors or other vehicular surfaces. Marketers who cannot afford to invest in multimillion dollar advertisements can get contented with its investment because it is going to work for them. It may not impress thousand minds at a time; still it can steal few inquisitive glances whenever people notice it from near corners. You make the best of these glances by positioning your business information large and clear. 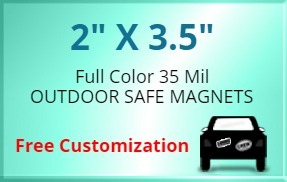 Request a quote to know discounts that we may offer you on wholesale promotional 2x3.5 business card magnets outdoor safe. Product Weight: 10 lbs per 500 magnets.